How to reach Genoa by car, train, plane. The collapse of the Morandi bridge has forced a revision of traffic arrangements in the west of the city and those arriving from the west – on the A10 from France, Ventimiglia and Savona – must of necessity take the Genoa airport exit and take the city route that leads to the new six-lane Guido Rossa Road, continue along the Lungo Mare Canepa and, using the Sopraelevata Aldo Moro (*), reach the Hempel World Cup Series Village. Those arriving from Turin must continue on the A21, beyond the A26 fork, and join the A7 for Genoa exiting at Genoa West or Genoa East. The same applies to those arriving in Genoa by car from Milan on the A7 motorway: the exit at the Genoa West tollbooth allows direct access to the Sopraelevata Aldo Moro to reach the Hempel World Cup Series Village. Alternatively, they may continue to Genoa East and then drive down directly to the fair area where HWCS is based. Road traffic arriving from the East on the A12/E80 motorway has several options for reaching the city without route changes respect to the past. From the Genoa East exit it is easy to reach the Hempel World Cup Series area. The Genoa Nervi exit is an alternative, following Corso Europa which also leads directly to the same area. (*) Important: those using the Genoa West exit are advised that the Sopralevata Aldo Moro leading to the Fair is NOT open to vehicles weighing more than 2.5 tonnes. Vehicles exceeding this limit must use the city route. Genoa has two railway stations, Genoa Brignole and Genoa Principe, and you will arrive at one or the other depending on where you come from. The city is well connected by Regional, Intercity and Eurostar trains with the principal Italian and European cities. Genoa Brignole station is only 10 minutes on foot from the Fair area. 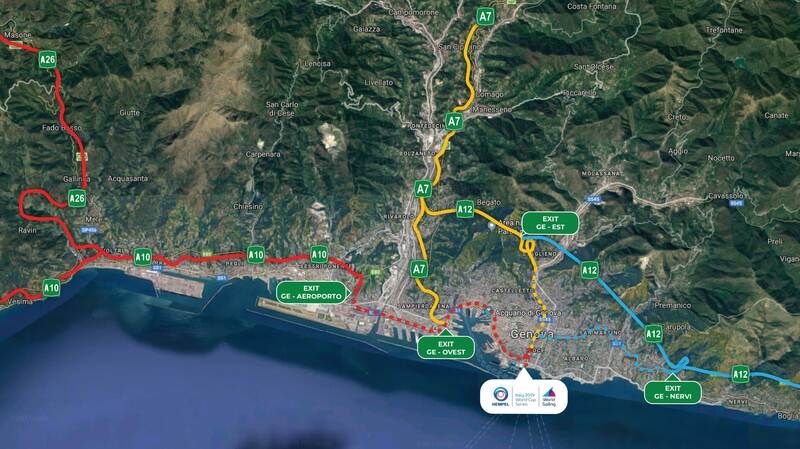 Genoa is connected with major international airports by the Cristoforo Colombo Airport in Sestri Ponente, 10 km from the Hempel World Cup Series Village. Several airlines connect the city with leading Italian and international airports. Once you arrive at the Genoa Cristoforo Colombo Airport you can reach the centre using the AMT Volabus shuttle. In the arrivals area you will find, at the City of Genoa welcome point, dedicated staff who can give you all necessary information. To improve transport for citizens and users, AMT and the Municipality of Genoa have started a free bus service (“Servizio speciale SP” – every day from 6 AM to 8 PM) between the Genoa Principe railway station in Piazza Acquaverde and as far as Sestri Ponente (Via Hermada) stopping, in both directions, at the Cristoforo Colombo Airport (Arrivals area, ground floor). Frequency: every 15 minutes. Operational from 6 AM to 8 PM. The service is free. Also operational is the Volabus service, which passes through the city centre. The Cristoforo Colombo Airport is about 10 km from the Hempel World Cup Series Village.